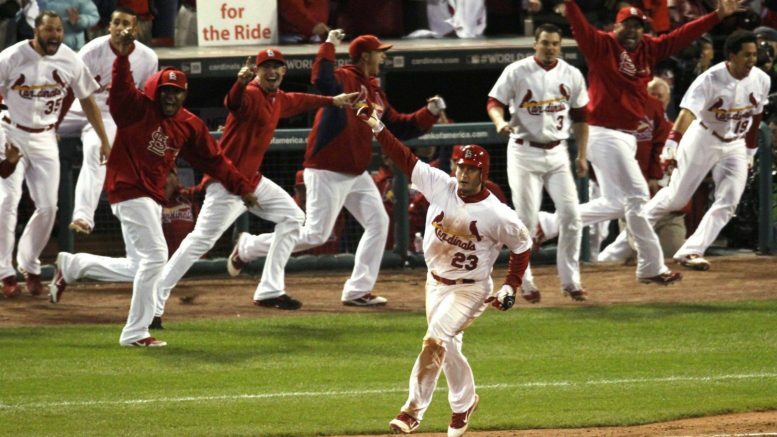 David Freese's walk-off home run capped one of the most memorable games in MLB postseason history. One of the most forgotten elements of Game 6, won by the Cardinals 10-9 in 11 innings after trailing by two runs in the ninth and 10th innings, is that it was originally supposed to be played a day earlier. Pending rain forced Major League Baseball to postpone Game 6 on Wednesday afternoon, several hours before the scheduled start. No one will ever know how it would have played out had it gone on as planned that day, but we do know that it would not have been the exact same game as the one that may go into the history books as the best ever. It also allowed the Cardinals to bring back their ace, Chris Carpenter, on three days rest to start Game 7, which he was victorious in. Whether it was the chilly temperatures, the extra day off, or just general nerves, Game 6 was pretty ugly through six innings. The Rangers and Cardinals combined to make five errors, and the Cardinals scored the tying run in the sixth inning without hitting a ball out of the infield. Freese was on the hook to be one of the goats for dropping a routine pop-up that led to a fifth-inning run before he bailed himself out with his game-tying two-run triple in the ninth and walk-off solo home run in the 11th. There was a head-scratching bullpen snafu in Game 5 that cost St. Louis a victory and sent the series back to Busch Stadium with the Rangers leading 3-2. Chris Carpenter had held Texas in check through seven innings, and the game was tied 2-2 when La Russa turned the game over to his bullpen in the bottom of the eighth. La Russa had it in his mind that de facto closer Jason Motte would be called on to bail him out of a tough spot should it present itself, and sure enough it did. Texas loaded the bases against lefty Marc Rzepczynski, bringing up Mike Napoli, who would have been the series MVP had his club won. La Russa had called down to bullpen coach Derek Lilliquist to get Motte ready, but somehow Lilliquist heard Lance Lynn’s name. Lynn was supposed to be unavailable, forcing Rzepczynski to stay in to face Napoli. Sure enough, Napoli smacked a game-winning two-run double. La Russa, who had called down again to get Motte loose, went to the mound to remove Rzepczynski, only to be surprised to see Lynn jogging in. La Russa had Lynn intentionally walk Ian Kinsler before finally bringing Motte in to escape the inning, but the damage was done and Texas had a 3-2 lead heading to St. Louis. Holliday, who was rather banged up throughout the 2011 postseason, finally broke the last straw when he sprained his wrist diving back to third base on a critical play in which he was picked off with the bases loaded in the sixth inning of Game 6. Holliday, one of St. Louis’ middle-of-the-order bats, was removed from the roster prior to Game 7 in favor of Adron Chambers. That gave Allen Craig a start, and Craig was up to the task as he homered to put the Cards ahead to stay in the clincher. While La Russa’s decision to tab Carpenter for Game 7 was a no-brainer, he had played it somewhat coy until after Game 6 was in the books. On the flip side, Washington was adamant all along that Matt Harrison, who had a strong regular season but was knocked around in Game 3 of the series, would be his guy in Game 7. That was somewhat puzzling given that he could have brought back Derek Holland on regular rest, five days after Holland completely dominated St. Louis’ potent lineup with 8 1/3 shutout innings. Instead, Washington utilized Holland in relief in Game 6 to bridge the gap to Mike Adams and Neftali Feliz, and Harrison lasted only four innings while allowing three earned runs in a losing Game 7 effort. In what ended up being his final hurrah with the Cardinals, franchise icon Albert Pujols had a rather poor series outside of one historic performance in Game 3. Pujols became just the third player to homer three times in a World Series game as the Cardinals routed Texas, 16-7, but other than that 5-for-6 performance he was held hitless until sparking the Game 6 ninth inning rally with a double. Pujols also made a key defensive miscue in Game 2, failing to corral a cutoff throw on Elvis Andrus’ ninth-inning single that allowed Andrus to move to second base. Andrus came around to score the winning run after a pair of sacrifice flies, allowing Texas to tie the series at a game apiece. It’s got to be a painful thought for Rangers fans who can’t fathom how Feliz let them down with a chance to nail down the clincher knowing that two of today’s top relievers were on the team, but not active for the World Series. Koji Uehara, acquired from Baltimore at the trade deadline for Chris Davis and Tommy Hunter, and Darren O’Day, who is currently with the Orioles, both did not make the cut. Uehara was left off in favor of Mark Lowe, who surrendered Freese’s walk-off blast in Game 6, after allowing five earned runs in just 1 1/3 innings in three playoff appearances. O’Day, shuttled between the majors and minors in a season that featured two stints on the disabled list, did not do enough to convince Washington to add him to the bullpen mix in October. The Rangers’ bullpen compiled an unsightly 7.43 ERA for the series, including three separate blown saves in Game 6 alone. In a cruel twist of fate, one bad pitch from Rangers ace C.J. Wilson in an exhibition game ultimately cost Texas homefield advantage in the World Series. The rule that stipulates that the winning league in the All-Star Game burned Texas when Wilson surrendered a three-run home run to the Brewers’ Prince Fielder, and the National League won 5-1 to give the NL home field in the World Series. Milwaukee won the NL Central and had the Majors’ best home record in 2011, but was beaten by the wild card Cardinals in six games in the NLCS. It was 11 for 11 in ’11 for St. Louis, as the Cards won 11 games to earn the franchise’s 11th World Series title in 2011. Moreover, because it was his final go-round with the Cardinals, it ended Pujols’ 11-year run with the team in style. And in Game 6, a night in which the Rangers seemingly had the game won twice, St. Louis rallied for an improbable win in – you guessed it – the 11th inning. Having lost ace Adam Wainwright before the start of Spring Training, Carpenter became the staff workhorse, and took that moniker to a new level in October. Twice pitching on short rest, Carpenter delivered two outstanding, winning performances in series-clinching games. But the cost was high. Carpenter pitched 36 innings in the 2011 postseason over six starts, but only hurled 30 2/3 innings in 2012 (including postseason) and that was all for Carpenter as continued complications with thoracic outlet syndrome ended his career after that. Be the first to comment on "10 Things You Probably Forgot About the 2011 World Series"